Bix Arramida scrutinized the ship that lay motionless – lifeless – few kilometers away. It was a luxury yacht, made by the Viziam company. An old version; popular half a century ago. The numerous pockmarks on the hull and general metal wear indicated this ship had been floating here for as long. It was also immediately apparent that the yacht had not stopped here to allow the passengers to marvel at the view; deep scars not born by erosion crisscrossed the hull and the view here in deep space was far from spectacular. In fact, so far was the ship from any settlements or stellar objects that locating it without knowing its exact coordinates would be like searching for a grain of sand at the bottom of a worldwide ocean. But Arramida had the exact coordinates. His benefactor had given them to him. Not knowing who his benefactor was still irked Arramida to no end. He only knew his first name, Norid, and that he was an Amarrian like himself. Other than that, nothing. A few months earlier Norid had approached him through underground channels. The job offer was simple – travel to certain coordinates in the Rethan system and retrieve all bodies from a derelict ship there. Then he was to take the bodies to a specific cloning facility on Rethan V and dump them there. That was all. No explanations. But for the amount of hard cash Norid offered, explanations became trivial. Arramida’s sensors indicated life-signs aboard the ship. Further scans revealed a total of 15 people – still lost in cryo-sleep after all this time. Arramida had to wonder who had attacked the ship all this time ago and why this same attacker hadn’t bothered to finish the job once started. Arramida didn’t have any equipment to enter the ship and fetch the bodies, but a few careful slashes with laser cannon carved the ship up nicely. Then it was just a matter of sending in a couple of salvage drones to pick up the cryo-caskets. The crude operation naturally killed the sleepers, but the job didn’t require him to bring back any survivors, so it didn’t worry him all too much. Arramida quickly scooped all the caskets into his own ship, taking care not to spoil any of the bodies. Norid had been very specific that none of the remains should be damaged. As an afterthought, Arramida scooped up some cargo containers floating out of the wreckage – nothing wrong with earning something a little extra on the side, he thought. Once finished, he set his course to Rethan V to turn in the bodies and collect his reward. 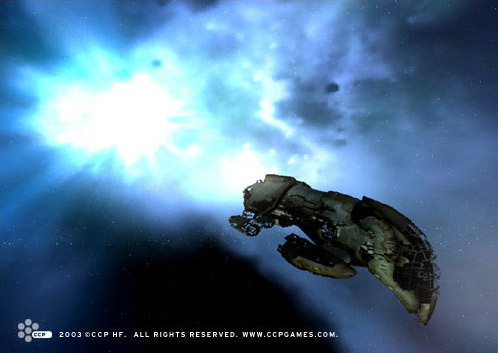 The moment Arramida had undocked from the clone station he sent a message to Norid, telling him the job was done. Then, chuckling over the fortune he’s made for such an easy job, he made his way to the nearest leisure station. Norid re-read the message from Arramida with glee. At last, the final part of his revenge was in motion! The sweet taste of it, after all these years of plotting and planning, shook his frail old body. Of course Norid wasn’t his real name. He would never reveal that to an oaf like Arramida. But Norid was a good name, maybe he would continue to use it once it was over. Yes, that was a good idea, he decided. It nicely underlined the new beginning he would make after the deed was done, when he could finally throw off his shackles and rise like a Phoenix to his former glory. Norid sent a quick message to the clone station, giving them the necessary DNA information to pinpoint the body he wanted sent to him. The rest they could use themselves as a form of payment for the services. The body he wanted should arrive within the next two days. Just as he finished sending the message, his master rang him. It was time for the master’s tea. Norid was a slave. He had been slave for almost a century. He was getting old, but the implants he had from the time when he was a Holder were still ticking along nicely. Norid certainly didn’t feel two centuries old. Occasionally his implants needed a little bit of maintenance, but his master was kind enough to allow them. If only he knew that by doing so he was aiding Norid in executing his revenge on him. Norid scuttled along the corridor with the tea tray and entered the study. The master could have used service robots or android automatons, but like all Amarr Holders he wanted the respectability of having a slave serve upon him. Norid didn’t blame him – soon he would have slaves of his own. Norid scrutinized the master. He was old, even older than Norid, and once the two of them had been bitter rivals in Ardishapur’s court. Even after all this time, Norid could still feel the hatred coursing through his veins – hatred towards this man for what he had done to him and his family. Crushed like little pegs in political machinations, they had been stripped of their titles, their wealth and their ancestry, then sold like common slaves. His wife and son hadn’t survived long in the forced-labor camp. But he had survived, kept alive by his hatred for the man that was responsible for ruining him and killing the two people he loved. For years Norid had nurtured his hatred, using it to drive him onwards – towards revenge. Slowly, but surely, he had inched closer to his nemesis, until he had entered his service as an attendant slave. The master didn’t recognize Norid for who he was – he only knew he was a former Holder. Having a former Holder as his personal slave sustained the vanity of the master. In the decades since Norid had plotted his master’s downfall. Death wasn’t good enough. Something more elaborate was needed – a poetic justice. And now, the plan was finally bearing fruit. The body of the master’s son was on his way – rescued from the ship Norid had sabotaged long ago, waiting in his cold grave for the time when he became useful to Norid’s plans. Now that time had come. For years Norid had lurked in the shadows, gnawing at the political and financial strength of the master. All that was needed now was a slight push to crush the master’s prestige once and for all, ruining him as completely at he had once ruined Norid. But that wasn’t enough. Norid smiled at the thought of what was to come. His master, sipping his tea, noticed it. “Why are you smiling like a fool?” he asked sternly. Norid bowed his head slightly. ‘Yes,’ he thought. ‘And then I will kill you and you will be cloned in your son’s body, and then I will ruin you and take your place.’ Norid started smiling again and served his master another cup of tea.